In his campaign for Texas Land Commissioner, George P. Bush (son of Jeb, nephew of George W., and grandson of George H.W.) claims that he is a businessman, touting the fact that he is a founder of St. Augustine Partners in Fort Worth. But what, exactly, is St. Augustine Partners? According to the certificate of formation filed with the Texas Secretary of State, St. Augustine Partners is a limited liability company that was formed in 2007. As of a May 13, 2013 change-of-address report filed with the secretary of state, its business address is East 4th Street, Suite 201, Fort Worth, Texas. 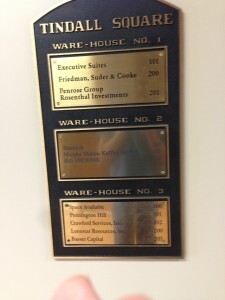 On the left is a photograph of the office directory posted in the lobby of 604 East 4th Street. 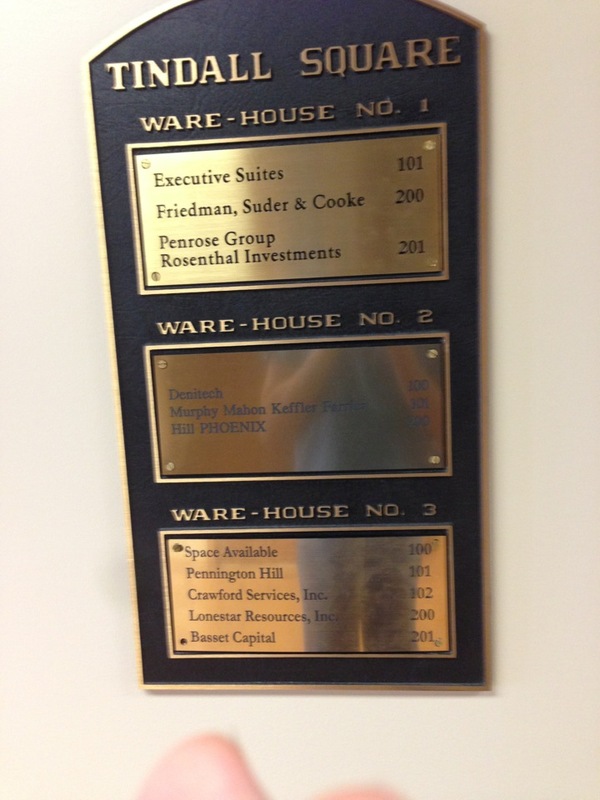 As you can see, Penrose Group and Rosenthal Investments are located in Suite 201, but the directory says nothing about St. Augustine Partners. Prior to May 13, 2013, company filings listed 4062 Bunting Avenue, Fort Worth, Texas as the “business” address. I found a picture (right) of that address on Zillow.com, and it appears to be someone’s home, perhaps Bush’s home. [UPDATE@4:30p.m. 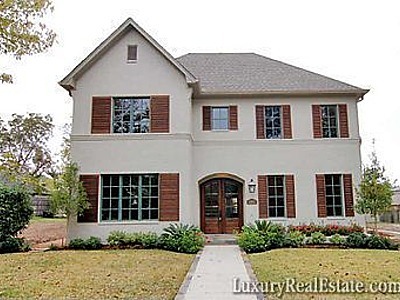 on 12/2/13: My cousin and fellow muckraker Don Mullins got on the Tarrant Appraisal District website and found this appraisal record confirming that it is George P. Bush’s home]. Better yet is the company website, which basically says nothing: name, address, phone number, and e-mail. That’s it. I’ve attached a frozen copy of it here, lest someone rush to change it. Based on the publicly available evidence, St. Augustine Partners looks like a shell company created on paper to make it appear that Bush (1) has a job and (2) has business experience. After the Fort Worth Star-Telegram ran a puff piece on June 26, 2013 about George P., I sent the reporter and an editor a copy of the lobby photograph (above), but I never got a response. (I don’t know the reporter, Anna Tinsley, but her story reads like a campaign press release.) I’ve since sent the photograph to several journalists, but thus far nobody is asking any questions. Why not? Would it really be that hard for a reporter to call the number on the website and ask what St. Augustine does, how many employees it has, who its customers are, or how much business it does annually? Is it a real business, or is it just a holding company for the Bush family’s assets? In fact, judging from his campaign website, Bush does not even understand what the Texas Land Commissioner does. Under “Issues,” Bush lists only one issue: education. “As land commissioner,” he writes, “I will have a plan for our schools,” explaining that he wants to raise academic standards, emphasize math and science, and expand school choice. The problem? The General Land Office has nothing to do with academic standards, curriculum, or school choice (perhaps Bush should consult the GLO website to learn more about the land commissioner’s actual responsibilities). If you think I’m being too hard on George P., ask yourself this question: what do you think the mainstream media is going to do when (not “if”) he runs for governor, senator, and/or President? Remember how CBS and Dan Rather tried (and failed) to impugn George W’s military service? You can bet they’ll be asking how a lawyer with no military or intelligence experience got a direct commission as an intelligence officer in the Naval Reserve. I recently learned that Bush is refusing to speak anywhere that Watts is speaking, and he certainly is not going to debate Watts. Access to Bush is restricted and questions are limited, if they are allowed at all, which suggests George P. is not comfortable with the common folk or their impertinent questions. And given the lack of substance, it appears that Bush is running more of a popularity campaign for senior class president than a campaign for land commissioner. Meanwhile, Watts is traveling the state, meeting people face to face, taking questions on the radio, and speaking to Republican and tea party organizations large and small. That reminds me somewhat of David Dewhurst vs. Ted Cruz, i.e., money vs. message. Watts recently won a straw poll of Republicans in Montgomery County, the suburban county north of Houston, although it remains to be seen whether he can achieve critical mass in a much-shortened primary season. George P’s campaign often proclaims him the “next generation” of Texas or GOP leadership. If that’s true, we may be in some deep doo-doo (to borrow a phrase from George P’s grandfather). The Bush family has produced some outstanding Americans, but political dynasties usually decline in the succeeding generations. Prescott Bush (George P’s great-grandfather) was first elected to the U.S. Senate in 1952, and it seems to me that three generations of Bushes in politics is enough. And no, I don’t think Jeb should run for President, either. If George P. was his own man with his own ideas, that would be one thing. Instead, he looks more like a young British royal or aristocrat, carefully groomed to ascend the throne or take over the family estate. Thanks, but no thanks. Dynasties are for Democrats, and I’m all Bushed out. George P must have forgotten there are ways to check addresses to see what is really there. From this article it would be certain if George P doesn’t want to answer questions now and is pretty much sequestered from anyone in general, it certainly won’t be better if he is in office. David Watts appears to be a very strong conservative. George P Bush should not be in an elected position of any kind! Very interesting piece on George P. Bush. Looks like “smoke and mirrors” runs in the family. David Watts is the only true conservative in this race. If George P. Bush is willing to pad his resume on his job & credentials, what else will he deceive Texans about?